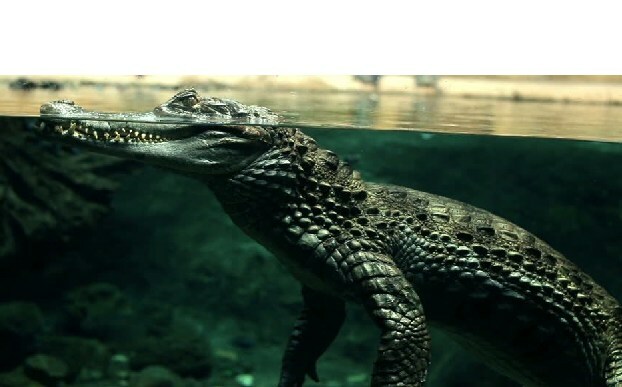 Did you know that a alligator can bite up to 5000 pound of force and is the strongest bite in the animal kingdom? The scientific name for the alligator is Alligator ​mississippiensis​. The alligator has 4 short legs and has a dark grayish color and a U shaped snout and a long muscular tail, they are also covered in scales. Alligators are found in wetlands, ponds, rivers and lakes, and they range in the southeast of the United State such as Alabama, Arkansas, Florida, Louisiana, Georgia, South and North Carolina, Texas and Oklahoma. A large male alligator can grow up to 13 to 14 feet long and weigh about 400 to 500 pounds and a female alligator grows about to 9 to 10 feet. The alligator can eat about anything such as fish, turtles, snakes, mammals, birds and even another alligator. The alligator are hunted for their skin to make boots,shoes and saddles. Alligators have a life cycle like every other living thing. The alligator’s life starts in its egg. It uses its egg tooth to break out of the egg. Then it crawls out and hunts for food. The alligator will stay with its mom for a year then it will live on its own. When the baby alligator grows up it could live to be 50 to 80 years old. During its lifetime the female alligator will build a nest then cover it with mud and put its eggs inside. The female may lay up to 10 to 70 eggs. When the eggs hatch the life cycle starts over. The alligator once faced extinction and the U.S. Fish and Wildlife service placed them on the endangered species list in 1967. In 20 year the alligator were take off the endangered list now their main theat is habitat destruction, caused by human activities as draining and developing wetlands. The alligator at WEEC is a small, two year old alligator, about two feet in length, and it eats 2 small mice. The alligator has some pretty cool adaptation such as it big tail it helps the gator swim. One of my favorite adaptation is called there “third eye” or the nicitating membrane which helps the gator see underwater.